Pop singer-songwriter Halsey notches her first No. 1 album on the Billboard 200 chart, as her second full-length studio effort, hopeless fountain kingdom, debuts atop the list. The set, which was released on June 2 through Astralwerks Records, earned 106,000 equivalent album units in the week ending June 8, according to Nielsen Music. Of that sum, 76,000 were in traditional album sales. The Billboard 200 chart ranks the most popular albums of the week in the U.S. based on multi-metric consumption, which includes traditional album sales, track equivalent albums (TEA) and streaming equivalent albums (SEA). The new June 24-dated chart (where Halsey debuts at No. 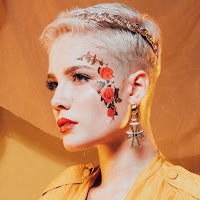 1) will be posted in full to Billboard’s websites on Tuesday, June 13.
hopeless fountain kingdom follows Halsey’s first full-length album, Badlands, which debuted and peaked at No. 2 with 115,000 units earned in its first week. Of that sum, 97,000 were in album sales.